When Sinn set out to create this new watch they did something that no one, including us, expected them to do. They answered one of the most requested features in the Sinn 103 Series that we hear at our Road Shows, and that is to create a watch with the same highly domed crystal used on the acrylic model but make it with sapphire to reduce the chance of scratching. Previous versions of Sinn 103 watches using sapphire crystals have featured a slightly curved rather than highly domed crystal due to the difficulty in creating a highly domed sapphire crystal which is also resistant to shattering. These watches have also featured screw down pushers and crown. The design of the sapphire crystal on this watch is virtually identical to the highly domed design used on the Sinn 103 acrylic models, but making this sapphire crystal a reality was no easy feat. First, Sinn had to design and manufacture a special set of grinding tools just for this watch. Next, they started with a solid piece of sapphire crystal 5 mm in thickness, and ground the crystal using five different curvature radii. The result is a classic design featuring the vintage feel of the Sinn 103 acrylic model but with a highly domed, scratch resistant sapphire crystal. Because Sinn wanted to preserve the vintage feel of one of their earliest watches, they based this watch on the Sinn 103 acrylic case. As a result, this watch retains the screw down crown but does not incorporate screw down pushers used in other Sinn 103 sapphire models. And unlike the 103 acrylic models, Sinn added a flat sapphire crystal to the back of this watch to show off the highly decorated movement. 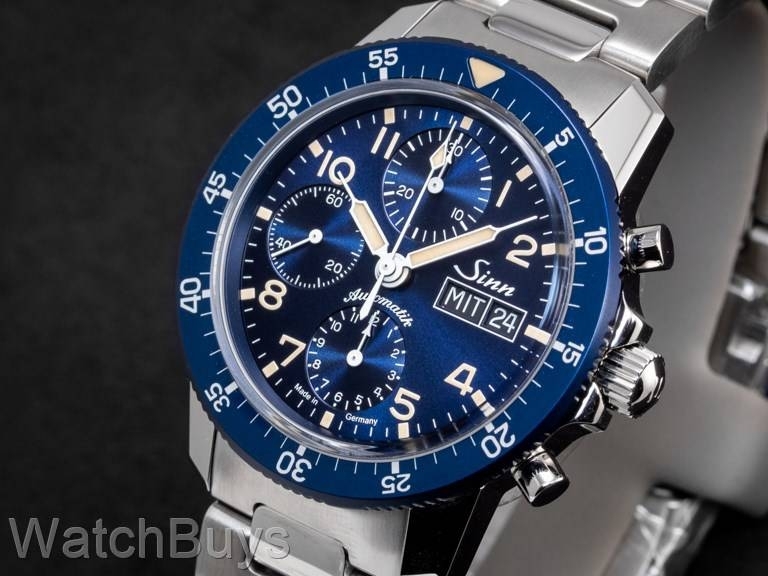 Another first for Sinn is the combination of a blue dial with a blue bezel. 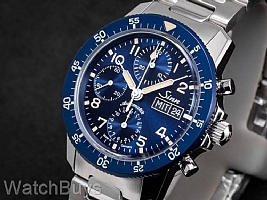 The blue dial features a subtle sunburst decoration, and the friction fit bezel is anodized completely in blue. Sinn chose not to use a ratcheting bezel but instead preserved the vintage qualities of the earliest Sinn 103 models, all of which used friction bezels. By combining the best features of the Sinn 103 acrylic watches with the new technologies used to create the sapphire crystal, dial and bezel, Sinn has successfully integrated the old with the new, and the end result is striking. This watch is fitted with a Sinn H-Link bracelet in steel.